Why customer experience drives your brand, the keys to building great customer service habits, and why so few brands are using CX to differentiate. Customer experience creates your brand, not the other way around. Being consistently amazing is about building amazing habits. Why customer experience is the biggest opportunity of 2018. This week’s article is an opinion piece by Joe Heapy of the Drum, entitled, “Why the customer experience function should now be in control of the brand.” The premise here is that the brand marketing team’s job isn’t just about broadcasting because customers judge a company by every interaction they have with it. The article goes on to explain why you need overlap between your brand proposition and your service proposition. If you’re running your marketing and branding based on an ad campaign, you’re missing the boat. Marketing strategy needs to be created in conjunction with the people who will deliver on the problems marketing solves. Figure out what your most remarkable experience is, and use that to get customers in the door. Shep Hyken started Be Amazing or Go Home when he noticed that his assistant was coming in late to work, which is a problem because his company’s motto is “always be amazing.” What he realized was that being amazing at customer service is really about building a series of amazing habits. The goal is consistent, good service that keeps people coming back over and over again. Good customer service habits create a consistently great customer experience. How you respond to a customer service problem makes a huge difference in customer loyalty. People do business with people, not organizations, and they do more business more often with amazing people. The annual Customer Service Index from Forrester ranks 314 brands across 21 industries based on a survey of nearly 120,000 US adult customers. This year, they found that from 2016 to 2017 customer experience had worsened across the board. We take a look at the numbers and what we can learn from them. Never play to the test with customer service rankings, focus on instilling the customer experience philosophy into your brand instead. Forrester’s list is a great place to look for brands that you can emulate. With so many companies falling behind, you have an opportunity to break through and become best in class. Individuals that had a great experience with a company spent, on average, spent 140% at that company. If you deliver a great experience, your customers will come back again and again. That’s the ROI on investing in CX. Customer experience is a great investment if you want customers who keep coming back. Dan Gingiss: Get ready for another episode of the Experience This Show. Join us as we discuss how customer experience has become synonymous with the brand, how to be amazing every single day and which companies are leading and lagging in the race for the best CX. Branding, amazing and lagging, oh my. There are so many great customer experience articles to read but who has time. We summarize them and offer clear takeaways you can implement starting tomorrow. Enjoy this segment of [CX press 00:00:40] where we read the articles so you don't need to. Joey Coleman: This week's [CX press 00:00:46] is an opinion piece by Joe Heapy of the Drum and it's entitled why the customer experience function should now be in control of the brand. Heapy's premise is that the brand marketing team can no longer get by just as a broadcast function. 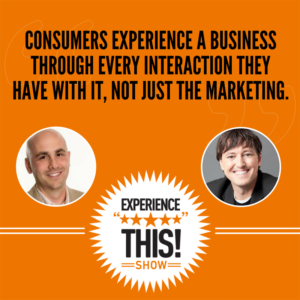 As we've talked about a lot of the show consumers experience a business through every interaction they have with it, not just the marketing. So here's where the article gets interesting. He says and I quote, customers are becoming a, more cynical about the messages pumped out and b, more demanding about the product or service. He also notes that "The proliferation of brands and the dwindling perceived differences between them means it's much harder to win the quality or price position war particularly as margins are squeezed. Everything now has to be very good and really great value." I absolutely love this article because they go on to talk about the fact that you need to make sure that there's an overlap between your brand proposition, what you want the world to believe about your company and your service proposition, which is what the customers actually need and value about your company. See, I believe there are just too many marketers who still believe that you're supposed to influence the consumer to believe certain things about the brain and instead of letting the brand perception kind of emanate from the product and the service design in the experience and kind of have the consumer's opinion of you based on what they experience. I think it's interesting that your more established heritage brands often seem to come at this from the brand outwards. What do we need people to believe about us and then they have that first instinct is to answer that question by saying okay, well let's just tell them what they should think about us in a large ad campaign. Instead, what the brand should be asking is what would make for a really great service or experience for our customers, and then once we have that in place and we're delivering on that on a regular basis we then promote that and that becomes the brand story and that becomes the thing that people are talking about. What I really liked about Joe's article is that he kind of succinctly explains something that Dan I think you and I really connected on from the very beginning of maybe our very first conversation, which is the old way of doing marketing and branding and sales is dead. Put a fork in it, it's done. What we really need to be doing is coming at these conversations from the experience first and letting the brand spirit and the brand energy and the brand proposition kind of emanate from those customer interactions and that becomes what everyone's talking about. Dan Gingiss: Absolutely. I mean, unless the name of your company is The Dollar Store, people are not thinking about your brand based on whatever price you're throwing out there. They're thinking about your brand based on the product that you offer, the service that you offer and the experience that they have. And this idea of letting the experience lead the way makes so much sense because then you can listen to your customers tell you what's great about your brand and turn that around into marketing. It's actually one of the things that made me fall in love with social media was that I like to say that social media is the first marketing channel where customers can actually talk back. Now, for years we've had billboards and we've had direct mail, we've had television and print and others where it is a megaphone situation. It's a brand or a broadcast situation as Heapy says where the brand basically tells us what to think. And we don't get to express what we think. We just have to kind of take it and listen to it. And eventually we got DVRs and stuff so we could fast forward through it but that's not what the brand wanted either. And so this idea of in social that we put out a message and then we wait to hear what people say and they're going to tell us whether they agree with the message, whether they don't agree with it, whether we are portraying the brand in the way they're portraying it or some other way. So, I think this guy's right on time and I thought it was super interesting. Obviously, you know, we wouldn't have a show called experience this if the experience wasn't leading the way for brands right now. I think that one of the takeaways here which we all know is that the customer experience is the most important thing to get right. Otherwise, whatever you're promising from your brand doesn't really matter. Joey Coleman: I totally agree, Dan. With your permission can I get a little ramped up, can I be a little bold here? Dan Gingiss: I love when you get ramped up. Joey Coleman: Okay, so basically, this drives me insane because I think what is happening is in most organization one of two things is happening. Number one, they are so siloed into there's a marketing function, there's a sales function, there's a customer experience function and those silos are never supposed to interact with each other are never supposed to touch each other, that as a result people are kind of controlling their own [fiefdom 00:05:54] and believing what we have to keep driving the brand through the advertising campaigns because otherwise we'll lose our jobs. And the problem is these advertising him pains are developed without talking to the people who are actually going to deliver on the spirit and the ethos and the ethic that is put forth in the advertising campaign. For example, I actually happen to know the guy who developed the jingle Have You Driven a Ford Lately. Great jingle, very well known, did wonderful things for Ford. However, is anyone right now saying to anyone else have you driven a Ford lately. Like no one is saying it, even though it's the jingle, even though we've all heard it and this isn't a criticism of the jingle which by now is a good 20 years old and it's served its purpose very well. I think brands need to focus more on the experience instead of on the marketing messaging that they're creating. The second thing is I feel that in many ways advertising has become the equivalent of when you're doing a job search, when you print 200 resumes and do a mail merge and send them all out. It's the old school way of doing things that made you feel a little bit better about yourself but you never knew if it was going to work and oh, by the way, it probably didn't. We're living in a time and an era where if the experience is not the bulk of your focus, if that's not where not only your energy and your attention is going but your investments of time of effort and of money then you're completely playing a game that is an old school game that the new companies that are winning are not even playing anymore. Dan Gingiss: Dang, that was a good rant. I have one question for you, you'll probably guess what it is, have you driven a Ford lately, Joey? Joey Coleman: You know, because I rent cars I have had the opportunity to drive a Ford just a few hours ago in a rental car. But long story short again, it's not, and please, folks who are big Ford fans, don't be critical of the show. Like I said, I know the guy who came up with the jingle. Super nice guy, great jingle, everyone's heard of it. Fantastic for what it did at that time. If right now your thought is, I know, we're going to do great marketing and branding based on these jingles we create and based on these ad campaigns we create, our agencies create, you're missing the boat. There was an ad recently that ran in a skiing magazine for Snowbird Mountain. And I'm paraphrasing here because I don't have it in front of me. But basically there was a guy who did a review of their mountain complaining about how difficult it was to ski on this mountain and being like, this is too hard. They said it was more difficult terrain but nobody wants to ski this. And what they did in a brilliant move is they took this review and they ran the actual review as their ad campaign. So beautiful picture of the mountain with a one star review. And what it did is people loved it because Snowbird came out and basically said look, our mountain isn't for everyone as clearly this guy found out but if your the type of skier that wants to be challenged on the mountain more, we're the right place to go. And I think that type of energy and that type of capturing the experience that you've provided for your customers and then turning that into your ad campaigns is a much more effective way to market your product or service. Dan Gingiss: Absolutely. So we are out of the time period in which a jingle or a tagline or a logo or an icon are going to be enough. So, our suggestion to you is take a look at your company, figure out what is the experience that is most remarkable about doing business with you and use that to get more customers in the door because that's the thing that you're most proud of and that's the thing that you can be the most confident will create more customers and keep them there longer. We're excited to give you an overview of an important book you should know about as well the share some of our favorite passages as part of our next book report. 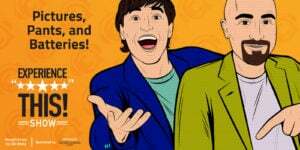 Today's book report is from a real friend of the show, customer service expert Shep Hyken, who just released a new book called Be Amazing or Go Home: Seven Customer Service Habits That Create Confidence With Everyone. Before we get into it let's hear from the author himself, Mr Shep Hyken, on what the book is about. Shep Hyken: Hi, Shep Hyken here, customer service and experience expert and I am so excited and honored to be a part of Experience This and sharing my latest book with the fans of this outstanding show. 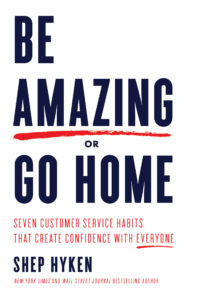 So the book, I just wrote, just came out in the last few weeks, Be Amazing or Go Home: Seven Customer Service Habits that create confidence with everyone, not just for customers but the people you work with. And you know what, even the people that you live with that you have personal relationships. Let's talk about how the book was written and it'll give you a great idea of what the book's about. So, one day I noticed that my assistant was coming in late and this happened two or three days in a row and I realized this is something I need to stop. So I had a little chat about it. Very next week, the same thing happened again. This was becoming a bad habit. And I sat down and talked to her and I said, what's our mantra at Shepherd Presentations, which is our company and that is simply to be amazing. As a matter of fact, we say always be amazing. And I said, do you feel that showing up late several times a week when you are my assistant and represent me in front of all of our colleagues here at work and even our clients who they want to call in right when we open our doors and turn on our phones, do you think that's amazing behavior? And she said, no it's not. I said, that's right it's not. So, you have a choice. You either need to be amazing or go home. And she smiled at me and she said, that is a great title for a book. We had a great relationship and by the way she started showing up on time and she fixed the bad habit. The bad habit became a good habit. And that's when I realized that customer service is really a lot of good habits. The people that are best at what they do have amazing habits of doing the right thing. So the first habit is amazing people show up ready to amaze. In other words, when the doors open at eight o'clock you're not just showing up at eight o'clock, you're there a few minutes before ready to go at eight o'clock. And other habits include being proactive, accepting and looking for feedback, taking personal responsibility and more. This is a book about great habit that great people have, amazing people have. And the book again is titled, Be Amazing or Go Home. Dan Gingiss: That's Shep Hyken, one of the true good guys in the business. Thanks for the great summary Shep. So Joey, let's talk a bit about these seven habits that Shep outlines. Joey Coleman: Well, habit number one is amazing people show up ready to amaze. I agree with Shep. This applies to every employee in every company. Each day you come to work is an opportunity to wow the customer. And let's face it, those customers don't really care about the fact that you overslept because you were out partying the night before or you're running late because you had a fight with your significant other. This isn't their problem and what I think is fabulous about Shep's philosophy and really this mantra is that he suggests that when you show up on time ready to perform that you are bringing a level of dedication and focus to your endeavors, which customers really notice and they pay attention to. He goes on in the book, he talks about the importance of remembering that you're always on stage when you're in front of a customer. And I think that is so true. Dan Gingiss: Totally agree. And many times these are, it's the front end people in your organization that make the most difference with customers because they're the ones that are directly interacting. Habit number two is that amazing people are proactive. Shep says not to wait for things to happen, instead, make them happen. Anticipate what your customers want and provide that to them even before they ask. And he introduces what he calls the loyalty formula, which is that good service plus consistency equals potential loyalty. I really like both of these things, this whole idea of proactivity is really key because when brands can do that, when they're smart enough to anticipate what a customer wants, that means such a big deal to the customer because it makes their life easier, it makes them feel that the brand understands them and it really drives loyalty. I think that his formula makes a lot of sense. Consistent good service. You don't want consistent bad service and you don't want inconsistent good service. You need both a consistency and the good service and that'll drive the loyalty. Joey Coleman: Absolutely. We don't want to give away the whole book but the other habits that Shep talks about in this fantastic book include amazing people want feedback, they take personal responsibility, they're authentic and they turn moments of misery into moments of magic. Finally, amazing people habitually focus on excellence. Let's go back to author Shep Hyken and get his favorite. Shep Hyken: The seventh habit is about habitually focusing on excellence. And within that chapter, there's a number of different ideas but one of them is to sweep like Beethoven plays piano. There is a short quote by Martin Luther King Jr. and it goes like this, "If a man is called to be a street sweeper he should sweep streets even as Michelangelo painted or Beethoven composed music or Shakespeare wrote poetry. He should sweep streets so well that all the other hosts of heaven and earth will pause to say here lived a great street sweeper who did his job well." It doesn't matter what you do, it doesn't matter how important your job is. How what you think maybe unimportant you job is. Your job is extremely important. Important enough to take pride and do well and make it amazing. Successful people, amazing people habitually focus on excellence. That's one of my favorite parts of the book, hope you enjoyed it. Joey Coleman: So great. The habit of excellence is so important. I know Shep's based in St. Louis and is from the Midwest. As somebody who grew up in the Midwest I feel like this is such a Midwestern thing. And I said that respectfully to folks on the coasts. But I remember as a kid my dad always saying to me, Joey, if it's worth doing, it's worth doing right. And I think that's in complete alignment with his habit of excellence. Dan Gingiss: Totally agree. And I really liked the MLK reference especially the note about sweeping like Beethoven plays piano. And actually my dad gave me I think similar advice when he taught me that every person in the company matters and that it's really important to get to know the secretary and the doorman and the person at the front desk because not only are they driving the experience for your customers but they're also often the people that know a lot about what's going on and can help you accomplish your own goals because they tend to be really, really valuable and they just want to be remembered as well and a simple hello or a wave or remembering their name goes a long way. Joey Coleman: So, so true. Dan, we had the chance to hear Shep's favorite passage. What was your favorite passage in the book? Dan Gingiss: Mine was, mistakes happen, remember that it's how you respond to the mistake that makes all the difference. And this one stuck with me probably for obvious reasons but this is really a lot of what I've been saying about social media customer service for years is that companies should not be afraid of complaints because people who are complaining about your business are actually doing you a favor, they're telling you what's wrong and they're asking you to fix it and that's what they want is they want you to fix it. So, how you respond to a mistake or a problem makes a huge difference if you're willing to fix it and make right by the customer, you can actually turn a detractor into an advocate. If you ignore it or deny it or are not willing to take responsibility you probably aren't going to have the customer for long. Joey Coleman: So true. My favorite excerpt from the book came right at the beginning and it's one of the things I love about Shep and he's a good friend of both of ours. You know, with Shep, there isn't a lot of fluff and I say that is a compliment. He's delivering golden nuggets right out of the blocks. In the book he, and I'm quoting here, he says, people do business with people not organizations and they do more business more often with amazing people. And I couldn't agree more. Regularly I find myself in conversations where folks say, well, our competitor's product is just as good as ours or they're beating us on price. Folks, if they're getting to price or the quality of your product in there evaluation and their consideration of whether to do business with you or not, you've kind of missed the point. They should be so enamored by you as a person and the thought of what it will be like to work with you as an amazing person that that should be able to transcend any other considerations they have. Now don't get me wrong, you need to be competitively priced, you need to have a good product but it really is about the people and it's one of the things that I love about Shep's message. Dan Gingiss: So do yourself a favor and go check out Shep Hyken's amazing new book Be Amazing Or Go Home, available now on Amazon. There's also a direct link in the show notes at www.experiencethisshow.com. Joey Coleman: Sometimes, a remarkable experience deserves deeper investigation. We dive into the nitty gritty of customer interactions and dissect how and why they happen. Join us while we are dissecting the experience. Dan Gingiss: Research Company Forrester releases an annual customer experience index that measures how well companies are performing at various aspects of customer experience. This year, they ranked 314 brands across 21 industries based on a survey of nearly 120,000 U.S. adult customers. Joey Coleman: And surveys says that Forrester found between 2016 and 2017 customer experience quality worsened across the board, wah, wah, wah. So bad. 49 brands lost points and only 24 gained points year over year. It's insane. The vast majority of brands landed in the okay or poor categories and only 16%, 16% of the 314 brands that they surveyed ranked it good. And zero ranked it excellent. Dan, what do you think is going on? Is Forrester just that super tough grader that you had growing up in school or is something else at play here? Dan Gingiss: Well, it always has been difficult to get an excellent rating from Forrester but I certainly don't blame them for that, I think it should be difficult to get an excellent rating. And seven of 21 industries had new top brands this year which I thought was really interesting and none of those changes though resulted from a major improvement by the new front runner which means that the companies are becoming stagnant when it comes to focusing on their customer experience. So I'm wondering, is it just that exhaustion has set in after all these years of focusing really heavily on customer experience and people like us telling companies that they need to focus on it? Is it that companies can't connect customer experience to any sort of measurable ROI? What is it, Joey? Joey Coleman: I think it's two things. I think it's customer experience is difficult. It requires a regular and daily commitment and number two, customer experience cannot be a this is what we're going to focus on this quarter type initiative. It's not an initiative, it's a philosophy, it's a way of being, it's an approach to running your business that puts the customer experience first. And I think a lot of companies aren't willing to make that commitment and really infuse it into their culture. What's interesting is when they looked across the entire survey, brands ended up landing in one of four categories. The languishers, brands that rose high and then stalled, which represented about 13% of the companies they looked at. The lapsers, which were the brands that rose and then fell, that was like 17%. Then the lock steppers, the brands that move up and down with the pack, you know, they're just following the herd, which no surprise there it was the majority at 43%. And finally the laggards, the brands that have stayed at or near the bottom from the beginning of their indexing survey which was 27% of the brands were defined as laggards. Dan Gingiss: And I was absolutely shocked that 70% of brands fall in these bottom two categories and what that's saying to me is that not enough brands have figured out yet that customer experience is the true differentiator. It's the one thing that your competitors really cannot copy. They can copy your products, they can copy your price but it is so hard to copy the unique experience that you offer your customers. It looks to me like not enough brands have figured that out. Joey Coleman: Absolutely. At the end of the day it just shows we have more work to do, Dan. We got to kep running the podcast, we got to keep talking on the stages we talk on and trying to remind people that this customer experience thing is not a fad, it's the only thing that's ever mattered when you really boil down to it. And in a world that is increasingly faced with everybody racing to the bottom on price, racing to the top on quality and racing to 24/7 365 accessibility and availability, the only differentiator you have is the experience your customers have. Dan Gingiss: Well, we here at the Experiences This Podcast like to highlight the best experiences. So we do want to point out that there were a lot of companies that did still perform very well. USAA topped the 2017 best in class list this year and the remainder of the 15 companies, congratulations to all of you in alphabetical order were BBNT, cricket wireless, Edward Jones, Etsy, The Hartford, Homewood Suites by Hilton, Lexus, MetroPCS Communications, AB Federal Credit Union, Omni Hotels and Resorts, QVC, Regions Bank, the Vanguard Group and zappos.com. Joey, which ones of those stick out to you? Joey Coleman: I'm very excited that there are some of those and full disclosure that I've had the pleasure of working with. The ones that really stick out to me are the ones that have this vibe of homegrown or communal as opposed to large operations. The one that really popped for me to be completely candid was Etsy. To stop and think about the experience that they're creating when they really are serving as a platform and a marketplace for a lot of their creators, I thought was really interesting. Dan Gingiss: So the official results of the Forrester Customer Experience Index are unfortunately not available to the public because they're behind a paywall but we will post some articles in the show notes at www.experiencethis.com that tell you more. And, if your company is a Forrester client, you can also go to forrester.com and download the full report. Joey, lead us into the takeaways. Joey Coleman: Let's do some key takeaways. Number one, you should never play to the test with these kind of rankings. These rankings are important but you should be focused on actually instilling the experience philosophy into your brand instead of worrying about where you score. That being said, you can definitely look at them as a good objective or indicator of the customer experience quality you're creating, particularly as you might benchmark against your competitors. Dan Gingiss: Also, another take away, Forrester does offer a great list of some amazing brands that you can emulate as you're building your own remarkable customer experience so the lists that I read earlier, these are brands that are getting it right. And it would be well worth everyone's time to take a look at them and figure out how they're doing it. Joey Coleman: And last but not least, people, there is an opportunity here. With so many lock steppers and laggards your company can be one of those that breaks through and becomes best in class. What's stopping you? We want to see you on the list next year. Dan Gingiss: Okay Joey. This week's number is 140%. What do you think it means? Joey Coleman: 140, 140. Oh wait, I know this one Dan. 140 is the number of characters you get in a tweet on Twitter, right? Dan Gingiss: That would have been the right answer a while ago but nope because now it's up to 280 but good try, good try. Joey Coleman: Oh man, I spent so much time learning that, are you kidding me. Folks, I'm trying to get better on the twittering. Dan Gingiss: I think I'll give you half a credit, get it. Joey Coleman: Half a credit, that was nice. Dan Gingiss: Anyway, that's not right. What is right was and it's a pretty interesting stat is that individuals who had a great experience with a company spent 140% more with that company. Now this stat which was originally in Harvard Business Review article comes to us from our awesome sponsors Oracle's CX Cloud and their new report sleepless over customer experience small, business leaders, top sales and service concerns and how to fix them. Joey Coleman: And people ask us all the time, well what's the ROI of customer experience? Folks, it's 140%. That's what the ROI is. If you deliver a great experience, those customers will come back again and again, they will spend more time with you, they will spend more money with you, they will become bigger raving fans. This stuff works, don't just take our word for it. It was in the Harvard Business Review, it's supported and promoted by our good friends at Oracle CX Cloud, believe it. Dan Gingiss: By the way, they'll also tell their friends who can spend more money. Joey Coleman: Which is awesome. Dan Gingiss: To find out more, go to oracle.com/increport. Enter your email address, get the full report and as always thank you to Oracle CX Cloud for sponsoring the Experience This Show.